Jaipur Rugs is a recent addition to our LodgeCraft family of goods. They are made with the finest fabrics including wool, silk, hemp, and cotton. Jaipur gives you plenty of choices when it comes to lodge furniture decor. Some of the rugs are "Quick Ship" rugs and ship within 5-7 days of receiving the order. Look at the description for the individual rugs, it shows if the rug is "Quick Ship" or not. The construction tab on the items page has simple instructions for care and cleaning of your Jaipur Rugs. Sizes are listed for each rug, but custom orders are available. If you ever see a Jaipur rug, anywhere, but you don't see it on our website, give us a call and we will order the rug for you if Jaipur still makes it. 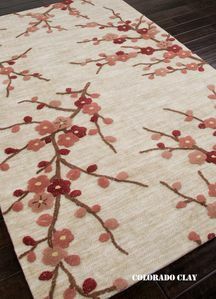 Call us and we can work with you to create the exact rug and size you need and what it will cost. Please enjoy your search!